Badge holder adapter attaches to any pre-punched ID badge or holder. Vinyl snap-on strap with nickel-plated steel bulldog clip. Great for visitors. 25 per pkg. Transcript: Welcome to MyBinding.com. These are the Badge Holder Adapter with Bulldog Clip from C-Line. Keep employees and visitors clearly identified with C-Line Badge Holders. These badge holders will easily attach to any prepunched ID badges. Open the vinyl loop, slip it through the punch hole in the badge, and seal closed with the strong metal button. The nickel plated steel bulldog clip secures the badge to clothing without damaging clothing materials. Top of the line materials guarantee these clips can be used and reused for years. Welcome to MyBinding.com. 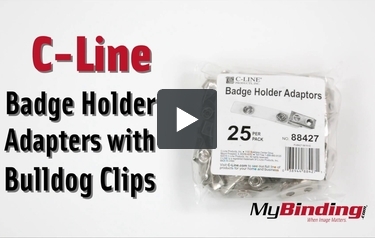 These are the Badge Holder Adapter with Bulldog Clip from C-Line.